When beef ranchers Bobbi and Chuck Lindemulder started their 100% grass-fed, direct market beef operation 15 years ago, they had little idea of the myriad challenges that would lie ahead. They both had extensive livestock experience growing up in the Snoqualmie Valley, but neither one had experience starting and managing a business. They could figure out fencing, grazing rotations, and what to do when the next flood hit, but did not know how to put together a viable farm business. As Bobbi puts it, “We had no idea how many things we had to learn about running a direct-to-customer farm business. With the rapidly rising trend towards eating healthy and local, increasing numbers of people are being drawn to the important work of raising healthy food for their communities. But, as with any business venture, there are an overwhelming number of details to take care of before you make the first sale. According to the Lindemulders, back in 2000, figuring out how to let people know they had beef for sale was a big challenge. The internet was still a novelty and not present in many homes. Neither one of them had any experience marketing themselves or a product. Because of an early decision to start very small, they were able to sell their beef to friends and family through word-of-mouth. “Since I knew next to nothing about marketing, it was scary those first few years,” says Bobbi., I was always worried that we’d have too few customers for too many cattle. “It sure would have been nice to have learned the basics of marketing to local consumers, I would have done a number of things differently right from the start,” she continues. However, as with any business, things are just starting to get complicated when the farmer makes a sale. Ensuring the price charged covers the costs of production, delivers a fair profit, as well as a fair price to the consumer, can be a moving target for those getting started. “Initially”, say Bobbi, “I was guessing as to the price we needed to charge to make sure we didn’t go in the hole. I spent a lot of time seeing what other farms were doing, what the price was in the supermarket, etc. It took a couple years to learn how I could figure out whether we were indeed covering our costs. I wasn’t familiar with doing financial statements, and spent many, many hours figuring out on my own what numbers I needed and how to use them. It was a painful process. “I’m guessing I probably spent two to three year’s worth of time learning on my own how to put together everything we needed to do in order to survive and become profitable. With no one to ask or teach me, I spent endless hours researching, guessing, changing, and learning. “That’s why I became an advocate and regular speaker for the Cultivating Success courses in Snohomish County . It’s wonderful to have this resource available to our farmers. I’m glad others won’t have to make some of the same mistakes we made. “Trying to grow an ag business of any sort is both a great opportunity and a huge challenge,” she continued. “Having access to the experts and resources the program brings in is like having a team of farm business consultants focused on helping your farm succeed. A collaborative effort, the Cultivating Success program combines expert-driven courses and on-farm learning experiences to help foster the success of new and existing farms and ranches. 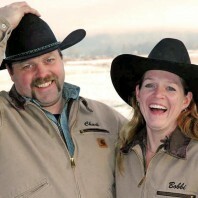 The Lindemulders are lifelong Snoqualmie Valley residents and have been raising grass-fed beef since 2000. For more information on them and their operation, visit West Valley Beef.